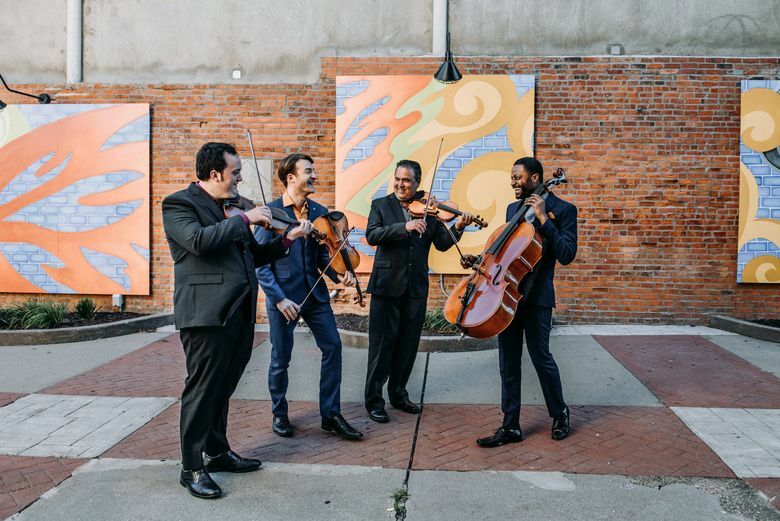 By “jazz strings chamber ensemble,” Balakrishnan not only means a group literally playing jazz, but also functioning as a mutable collective that can play everything from Haydn to Hendrix to Hubbard. Turtle Island performs a diverse repertoire, but to call it simply eclectic would not capture the passion for discovery emerging from its ever-changing roster (excluding Balakrishnan) of musical personalities. Asking Balakrishnan about the “Winter’s Eve” concert, it’s clear he intends some serious fun. On the program is an unexpected marriage of August Wilhelmj’s arrangement of the second movement from J.S. Bach’s third Orchestral Suite in D major, “Air on the G String,” and Miles Davis’ “Seven Steps to Heaven.” While that curious performance is likely to provoke later conversations over coffee about the kinship between these two pieces, Balakrishnan has a more sheepish explanation. Also on the bill are variations on Vivaldi’s “Winter” concerto. “The Vivaldi is one of our stalwarts,” Balakrishnan says. The arrangement, influenced by New Age music, came out of early Turtle Island recordings on the independent, instrumental acoustic label Windham Hill. Turtle Island will also play an old Irish reel called “Christmas Eve,” and a Hindu spiritual, “Vathapi,” a 19th-century composition Balakrishnan says was inspired by the sound of Irish fiddle music. Winner of Grammy Awards for Best Crossover Classical Album in 2006 (“4 + Four”) and 2008 (“A Love Supreme: The Legacy of John Coltrane”), Turtle Island currently consists of Balakrishnan (who will play both violin and baritone violin, which, he says, “has a reedy quality that works great for playing jazz”); cellist Malcolm Parson; violinist Gabriel Terracciano; and violist Benjamin Von Gutzeit. Past members include some heavy hitters: Jeremy Kittel (who has played with Mark O’Connor, Edgar Meyer and My Morning Jacket); Mads Tolling (Stanley Clarke, Leo Kottke); and Turtle Island co-founder Darol Anger (Grisman, Grappelli, Bill Evans).